Evans Fine Foods to close next month. 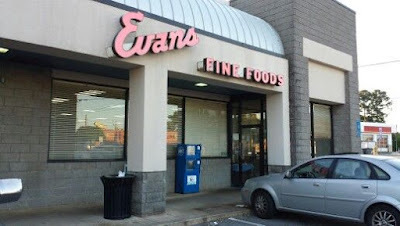 Evans Fine Foods, an intown icon for nearly 70 years, is slated to close next month. An employee at the restaurant confirmed today to Decaturish that the restaurant is closing. I subsequently confirmed the closure is (currently) slated to occur by mid-November. There are currently no plans to reopen the business elsewhere. Evans occupies a freestanding 3,400 square foot building in Emory Commons, a Publix-anchored center at the corner of North Decatur and Clairmont Roads. As sad as it is, I was literally driving by the restaurant this past weekend and thinking to myself how crazy it was that although I'd grown up nearby, I'd never dined at Evans. I've now committed to making it in before closing. Evans serves a variety of fresh vegetables, homemade desserts, and assorted other classic southern and diner fare. According to an obituary for Herbert Evans, one of the restaurant's original founders, the North Decatur location was once one of four locations in metro Atlanta. "In 1946, the first Evans Fine Foods opened at 290 Ponce de Leon Ave. In the years to follow, three more restaurants were opened on Peachtree Street, North Decatur Road, and Candler Road. Herb was the bookkeeper and his brothers (John & Tom) ran the day-to-day activities within the restaurants. The Evans brothers loved their restaurants and truly cared about their business and serving their customers. In 1982 the remaining restaurant on North Decatur Road was sold to Steve Kontos and Pete Costarides." What is your favorite dish at Evans Fine Foods? What would you like to see open in its place at Emory Commons? What is your favorite "classic Atlanta restaurant?" I remember Evans when I was a child in the 60s. That strip center also had a Zestos and an Ole Kind Cole Bakery along with various other shops. The section Publix occupies was once a boat dealership - Stovall. I last ate at Evans about 3 years ago. It was nostalgic, Greek diner style food. Fun, but not as good as the memories. Few things are, our memories embellish. Never ate at the one on N. Decatur, but back in the 1960's, the one on Candler Rd. had excellent fried Red Snapper. I’ve eaten there a lot with my parents over the years as it was one of their favorite Emory area places. They are both gone now and I occasionally stop in for a nostalgic visit and just to relive some of the memories. The food is decent more like “home cooking” than really Southern style food, but either way it was decent and fairly priced. The breakfast was always very popular especially on Saturday and waits for a table were not uncommon. Rumors have it that they were facing a significant increase in rent, but have no idea if that is true. I fear even though they represent a sort of classic iconic type of place the local taste have changed and I wonder if their business is what it once was. While a visit to Emory University/Hospital, CHOA or other area institutions always included a stop at Evans now it's more likely to be Community Q or simply Panera’s. Regardless of the reason Atlanta is losing another one of our classic restaurants/retailers and whether you liked the place or not it’s still kind of sad. There is one thing you can't escape about Panera - they are a modern and healthy rendition of an old school diner. Fresh baked breads and sweets, soups, salads, sandwiches, coffee - just like a diner sans hamburger - except very healthy methods of preparation. They should build a Panera right where Evans is - out with the old and in with the new. Panera is for people who don't know truly good food. Well oh wait, i'm actually a foodie, very much into fine dining, Farm to table, organic, part-time vegetarian,and what not. I know good food. It's not realistic or sustainable to not take advantage of quickserve for part of your week, unless of course you have a private chef. Even then, even so, are you so snooty and above and beyond and full of yourself that you can't find yourself walking into Panera? Come back down to earth man. 10/28/15 12:58PM is right, Panera is just ordinary at best. As for being "a foodie", there's probably a prescription or ointment for that. Here we are years later, I'm still avoiding Panera, and still missing Evans. Never considered myself a "Foodie", always like home cook'n tho. Miss those guys.